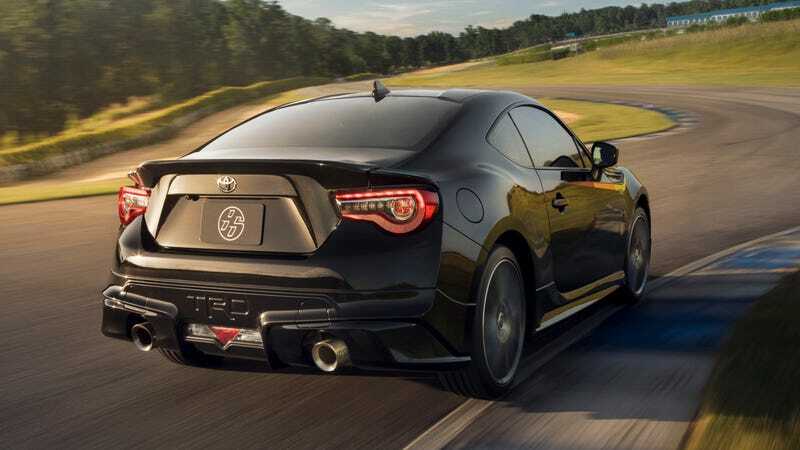 The beloved Toyota 86 is back for 2019 with a new special edition, this time featuring upgraded suspension, better brakes, grippier tires and of course absolutely no discernible power increase to take advantage of the newfound performance parts. This is in keeping with a time-honored tradition among Subaru and Toyota product planners of launching better-handling versions of a car that absolutely doesn’t need them. The new model, the Toyota 86 TRD Special Edition, features SACHS dampers and Michelin Pilot Sport 4 tires along with bigger Brembo brakes. Presumably this comes in response to the approximately six people who think the 86 handles poorly and needs more grip to tame the motor’s power. And in case I didn’t mention it, that motor continues to offer 205 horsepower when mated to the manual. In addition to the performance upgrades, the TRD Special Edition comes with visual cues to denote its importance. All 1,418 units will be painted Raven black, which compliments a tricolor TRD graphic and a TRD body kit. It’s unclear whether the body kit will affect high-speed stability and performance, but we do entirely know that it shouldn’t matter because power hasn’t been increased. The makeover continues inside, where Toyota has added a red stitching, a new steering wheel, some TRD badging and a few other minor things. Major upgrades, like a turbocharger or any power increase, are not available. I swear to God I didn’t make that up. This is what happens when Toyota tries to have a sense of humor. And because buyers expect to pay more for organic versions of the product they love, Toyota is charging $32,420 for the TRD Special Edition. Because I want to make sure we’re clear, I should remind you that the price does not include a power bump from the regular Toyota 86. Perhaps there was no way to turbocharge it without jeopardizing its certified-organic status. It’s still fun! But just not what everyone wanted.